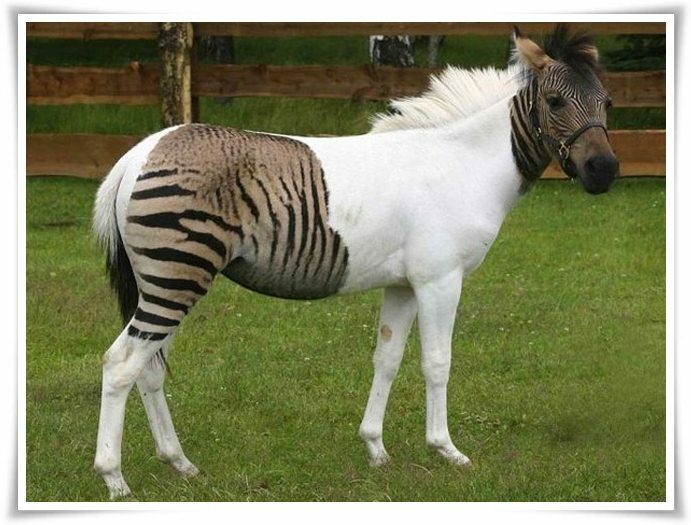 Zorse, also known as zebrule, is a hybrid animal, created by cross-breeding of zebra and horse. Due to differences in the geographic distribution, zebra and wild horse cannot mate in the wild, but they exist in the captivity since the 19th century. Zorse is sturdy and hardy animal that inherited the best of both parents. It is mostly used as a working animal, for transportation of goods and people and as a tourist attractions in the zoos around the world today. Mare gives birth to a zorse foal after pregnancy of 11 months. Zorse is able to stand on its own feet one hour after birth. It is small in size, but has extremely long legs at birth (length of legs of foal is nearly equal to the length of legs of adult zorse). Zorse can reach 51 to 64 inches in height and 500 to 992 pounds of weight. Zorse has short, coarse fur that can be white, tan, grey, red, brown or black colored with dark, zebra-like stripes on the legs and rear part of the body (stripes can be also seen on the head and neck). Unique pattern of stripes can be used for the fast identification of individual zorses. Zorse has large head, long muzzle, large eyes, pricked ears, short mane on the back and thin legs that end with (usually) black hooves. Zorse is a herbivore. Its diet is based on the grass and grains. Leaves, fruit and berries are occasionally on the menu. Zorse spends nearly entire day in grazing. Zorse has keen sense of taste and it often extracts (from the stack of plants) and consumes only its favorite types of grass. It recognizes and avoids poisonous plants. Zorse also has excellent sense of hearing and smell. It has visual field of nearly 360 degrees and very good night vision. Zorse is social animal that enjoys to spend time with other equines. Zorse is a product of crossbreeding of male zebra and female horse (mare). Zorse has urge to mate, but it is sterile and unable to produce offspring after mating with another zorse. Zorse has natural resistance to nagana disease (transmitted by tsetse fly). This trait is inherited from zebra; donkeys and horses are not immune to nagana. Zorse was used for transportation of heavy loads over the mountains and for riding until the beginning of the 20th century when it was replaced with cars. Popularity of zorse revived during the 1990s. Nearly all of 300 known breeds of horse are used for the "production" of zorses today. This large hybrids are mostly used as working and trekking animals, for riding or as a tourist attraction in the animal parks around the world. Zorse can survive more than 30 years with proper care.